National Music Centre: The Red Flag? I intentionally waited for over a year before visiting Calgary’s new National Music Centre (NMC), aka Studio Bell. I wanted to give it time to work out the bugs and get all of its exhibitions and programming in place. But, It was hard. The reviews of the interior architecture were all glowing. What I didn’t hear was how great the exhibitions or programs were. All the talk was about how spectacular the building was. To me, this was a red flag! However, after returning from Nashville and experiencing their music museums I decided needed to check out NMC. I called up a friend who also hadn’t made it to the Center yet (even though he had an annual membership for the first year) and made plans to go together. National Music Centre's lobby invites visitors to play pianos and guitars. I loved that as I entered the National Music Centre I immediately heard live music. It was young girl playing the Dean Stanton-decorated piano in the lobby. Then I heard a young man tickling the ivories on another piano in the lobby, as well as some guitar sounds from the exhibition space just off the lobby. GREAT - lots of hands-on opportunities for people to play and hear musical instruments. The lobby was visually uplifting with its five-storey central atrium and stairwell to the heaven (pun intended) with slivers of light shining through. Indeed, there was a sense of reverence - a cathedral-like sense of place. It is easy to get seduced by the museum's striking architecture. Unfortunately, as we proceeded through the exhibitions we both became less and less enchanted. There were lots of galleries that seemed to have very little in them or they had material to read but not much in the way of things to listen to or play with. A lot of the information was easily available on the Internet or was old news. An example of large exhibition space devoted to information that is easily accessible on the Internet. Given the Centre’s collection of over 2,000 musical instruments, we expected to see and hear hundreds of instruments. While there were some displays of instruments, it was often the same ones we had seen at the old Cantos Centre in the Customs House. And while there were some places with headphones that allowed you to hear the instruments, they were too few and the music offered too short. An example of one of the exhibition from the museum's collection. I was also expecting some kind of introductory video summarizing Canada’s music history. Something that would get me excited about what I was about to see and put Canada’s music into perspective. This exhibition of "Trailbrazers" looks like billboard. This would have been a great place for a video documenting the how Canadians have been music "trailblazers" for over a century. But surprising to us both, there wasn’t and we didn’t see it anything that would helped international visitors appreciate the unique regional music of Canada. For example, the role of the kitchen party in Maritimes and its links to Celtic music. It seemed logical to both of us there would be separate galleries celebrating each region with listening stations that would invite you to sit and listen to a spectrum of the region’s music. I was expecting something like the Musical Instrument Museum in Scottsdale, which organizes its huge collection of instruments into dozens of displays based on musical genre and countries. I missed the in-depth historical story-telling I experienced in musical museums in both Nashville and Memphis. For example, at the Country Music Hall of Fame & Museum in Nashville, there was a very large display of Shania Twain artifacts that not only told the story of her rise to fame, but also how she is responsible for linking country music to pop music, and thus significantly changing contemporary music. k.d. lang exhibition seemed more focused on fashion than on music and performances. Perhaps the biggest disappointment was we couldn’t see and hear the Rolling Stones Mobile Studio, as it is located in the King Eddy wing of the Centre, which is only open for special events. The state-of-the-art exhibitions I was expecting were not to be. I came away with the impression that the champions of the Centre spent lots of money and attention on the building design, but little on the exhibitions and programming of the space. On the upside, the highlight for me was the 15-minute live demonstration of the 1924 Kimball Theatre Organ that was used to make music and sounds for silent movies. The thundering sound of this huge instrument - the size of main floor of a 1950s house - was impressive, as were the range of sounds it could make. This is what I was expecting more of - turns out it was the only live demonstration of the day. If you came in the morning, there were no live demos. I would have loved to hear someone play some early Elton John on the white Elton John piano. Or how about a demo of the Theremin - a musical instrument that you control by waving your hands over it, rather than physical contact. I want to hear the instrument, not just read about them. To me, the key to a music museum is the ability hear lots of different types of music, not just read about it. And when the museum has a large collection of rare instruments, I want to see and hear them performed. While everyone is blown away by the architecture, it doesn’t really work well as a museum space. The open central atrium and tiled surfaces mean sound echoes through out the building. The ramp/stairwell of the Canadian Museum for Human Rights in Winnipeg has many of the same design vs function issues at the National Music Centre. It was really annoying when kids were talking loudly in the lobby (as you would expect) but you could hear them throughout the building. The stairwell, atrium and other design elements also mean there is actually less exhibition space than one would think given the size of the building. I had many of the same feelings, when I visited the Canadian Museum for Rights in Winnipeg. In both cases, the champions built a uniquely shaped building but that doesn’t function as a great exhibition space and has lots of wasted space. Canadian Human Rights Museum in Winnipeg. National Music Centre aka Studio Bell in Calgary. As a former art gallery director and curator, I am very cognizant of the fact the exhibitions and programming are the key to a successful gallery or museum, not the architecture. In fact, you don’t really need to pay admission to appreciate the NMC’s architecture - you do that from the outside and the lobby. Over the two hours we were there on a Friday afternoon in November, there were perhaps 35 people in the entire museum and only 11 showed up for the Kimball Organ demo. This pales in comparison to my experience at Nashville’s Country Music Hall of Fame and Museum a week earlier where hundreds of people packed the museum on a Monday morning. We were told it was a slow day. Nashville's Country Music Hall of Fame & Museum was busy even first thing on a Monday morning. While, the 163,000 square foot National Music Centre costs $191 million to build, I feel it would have been better to budget $125 million (for which you could still get a stunning building) and then raise $50 million as an endowment to create stunning exhibitions and programming, including having the King Eddy fully operational with live music 7 days a week. I am told the King Eddy will open full-time in July 2018. 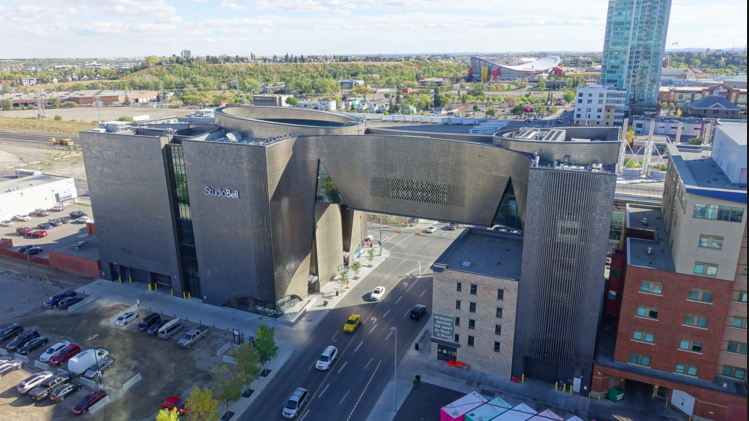 In fact, the 210,000 square foot expansion of bass clef-shaped Country Music Hall of Fame and Museum, which opened in 2014, cost $130CDN million and has very similar specs. I was expecting a lot of Calgarians to disagree with these observations, however, the response (10 emails and 2 calls) to date (Dec 7th) has all been in support of these observations. Canadian Museum for Human Rights: Money Well Spent?